This week at the annual J.P. Morgan Healthcare conference, secondary genomic analysis company Edico Genome announced it would provide analysis of genomic data for Genomics England’s Rare Disease Pilot program, which intends to make next-generation sequencing (NGS) the standard of clinical care of the U.K.'s National Health Service (NHS). “Working with Edico Genome, Genomics England moves one step closer to reaching genomic medicine’s full potential and improving the efficiency of whole-genome analysis to help diagnose rare diseases,” Joanne Hackett, chief commercial officer at Genomics England, said in a prepared statement. 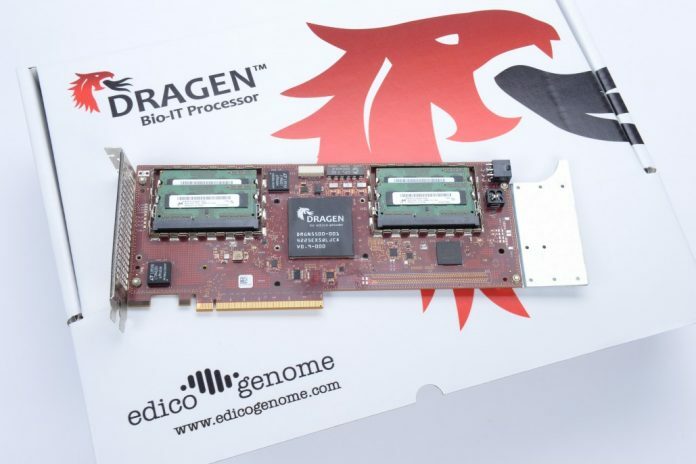 For Edico Genome, the agreement with Genomics England is the latest in a long string of high profile partnerships and collaborations the company has announced over the past year centered on the company’s DRAGEN (Dynamic Read Analysis for GENomics) technology platform. DRAGEN that enables of wide range of genomic data analysis including BCL conversion, mapping, alignment, duplicate marking, and haplotype variant calling, among others. First up for Genomics England will be using Edico’s technology is to reprocess roughly 5,000 whole human genomes of people with rare diseases. These genomes were originally mapped to the GRCh37 reference genome, but will be remapped to the newer CRCh38 standard. Genomics England will provide these reprocessed data to its partners in the Discovery Forum—a collaboration of industry, academia, NHS—for additional analysis. In conjunction with its new relationship with Genomics England, Edico Genome has also joined Discovery Forum. Genomics England was established in 2013 by the U.K. department of health to spearhead the 100,000 Genomes Project, which will sequence 100,000 whole genomes from NHS patients with rare diseases (and their families), and patients with common forms of cancer. Its broad aims include improving the health of NHS patients, further insights of the genomics causes of disease and to help foster the genomics industry in the U.K. Since its founding, it has forged technology partnerships with a range of leading commercial entities including WuXi NextCODE, Illumina, and Qiagen. Late last year, it entered an agreement with Inivata and Thermo Fisher Scientific to assess the quality of collected plasma sample and determine the potential of using liquid biopsies as a tool for improving patient disease assessment and management. Likewise, Edico Genome has just completed a very busy year and a half that has seen its technology platform made available in the cloud via agreements with DNAnexus and Amazon Web Services; the integration of its platform on Illumina’s BaseSpace Sequence Hub; and its use in the U.S. for publicly funded research being conducted by the National Human Genome Research Institute (NHGRI), and the National Cancer Institute. It also made news in late 2017 with the Children’s Hospital of Philadelphia (CHOP) for its Guinness World Record of the fastest sequencing of 1,000 human genomes, using the DRAGEN Genome Pipeline. The culmination of two years of work with CHOP, the record-setting effort highlighted the utility of providing clinicians with actionable genomic insights. “The speed of this technology in processing vast amounts of raw data, in a matter of minutes, will allow us to deliver actionable results in hours—an important capability as we go forward in realizing the benefits of precision medicine for children and families,” noted Hakon Hakonarson, M.D., Ph.D., director of the Center for Applied Genomics at CHOP.